After taking our break in the US around the holidays, we needed to book a new ticket to get back out on the road. We decided to fly to Bangkok as our next stop. This ticket turned out to be the most complicated one that we’ve booked so far, and the flight experience the most grueling. We have miles in a variety of places, so we started off by just seeing what the easiest way to get to Bangkok from Denver would be. It became pretty clear early on that flying on Star Alliance would be easier because Thai Airways is a member. United Airlines is a member of Star Alliance, so our first idea was to book the flight using United miles. However, Eric then realized that he was only 1,000 miles short of what he needed to book his ticket. He could have gotten the miles from someone else, but the fee associated irked him. We then had a flash of insight and looked into using American Express Membership Rewards points. These are points that we earned from each having one of the American Express Gold cards. The key idea to understand with these points is that they can be transferred to a number of different airlines where they become miles in that airline’s frequent flier program. However, we had an issue… Eric couldn’t transfer his points. He had downgraded his Gold card to a Blue card before we left for the trip last summer. This allowed him to keep the points, but he didn’t realize that it also meant that they were no longer transferrable. Apparently American Express has a Membership Rewards Express program that uses the same points but just with less benefits – and the Blue cards fall into this category. He was perplexed at what to do. Della on the other hand had downgraded to the American Express Everyday card, and she was still able to transfer points. So, Eric decided to also apply for the Everyday card and see what happened. Amazingly, after he got the card he was immediately again able to transfer points! So, with transferrable points in hand, we had to figure out what to do with them. United Airlines is not a Membership Rewards transfer option, so we had to get more creative. We remembered that Air Canada is a Star Alliance member and a transfer partner, so we looked into their Aeroplan program. The search tool on the Aeroplan site is easy to use, and we were able to find a series of flights on United and Thai Airlines that could be booked with Aeroplan miles (since they are in Star Alliance with Air Canada). So, we transferred the required amount of points to Aeroplan and booked the ticket! The main downsides of the ticket were that it left Denver so early, and the tight connection in Beijing. But we figured that would be fine…. We got up at 3 AM in Denver on January 6, and Della’s parents graciously drove us to the Stapleton Park and Ride to catch the bus to the airport. The first flight to Chicago was uneventful and on time. Given that we were worried about our Beijing connection, we crossed our fingers that the flight from Chicago to Beijing would run smoothly. It was listed as an on time departure and we boarded on time, but as we kept sitting at the gate we worried that something was wrong. Finally the pilot got on and explained that the loading of cargo had been delayed, but was about to wrap up. But then we still sat at the gate… Then the pilot came back on and said that we were waiting for a new ground crew to push us back. It was so cold in Chicago that they had special rules in place to limit the time people spent outside, and the first crew had exceeded that limit. We ended up leaving almost an hour and a half later than the scheduled time. It seemed like we might make up a little time, but we spent the whole 13 hour flight worrying about what would happen when we land. 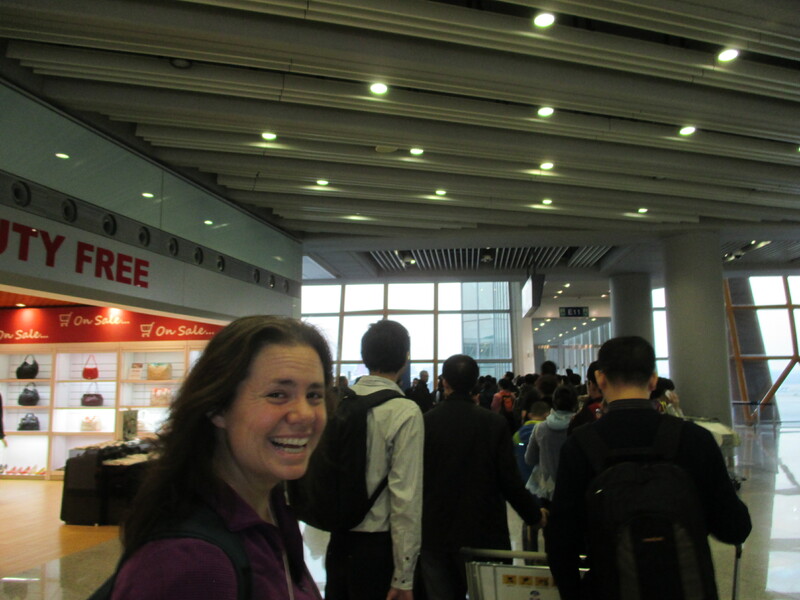 We arrived in Beijing at 4:30, meaning we had just half an hour to catch our flight. People on the plane were not very understanding about helping those of us with tight connections, so we had to fight our way through them to get off the plane. Even though our bodies were pretty stiff from sitting for so long, we ran through the terminal to get to the gate. We were slowed down a bit by having to do an immigration check for international transfers (not sure why they needed to give our passport a China stamp…) and an additional security check, although luckily in both places fellow travelers let us through when they heard our situation. We made it to the gate with only a few minutes to spare, but plenty of people were still in line to board so we were finally able to relax! We heard that five other people missed the flight, so we were pretty proud of ourselves for making it. Our 4.5 hour flight to Bangkok was thankfully stress-free. After the bare bones service on United, the service on Thai Airways was very impressive (free hard liquor on the drink cart and personal in-seat entertainment consoles). We were happy to have made it to Bangkok as originally scheduled, but not surprised to hear that our bags did not make the tight connection. The Thai Airways luggage staff made arrangements for our bags to make the first flight from Beijing the next day and then be delivered to us. We headed to our guesthouse, where we crashed after over 24 hours of travel! Sounds stressful! Glad to hear you made it there safe and sound and guessing your bags weren’t far behind! Excited to hear about Burma. Love and be safe!